The wall made famous by Keith Haring, now known as the Bowery Wall, gets a fresh coat of paint this week- head down to check out the process of photorealist stencil artist Logan Hicks. The [email protected] opens its doors for a rare look at New York Fashion from the Time LIFE archives, and the irrepressible No Wave performance artists host a night of seedy New York storytelling at the Django. 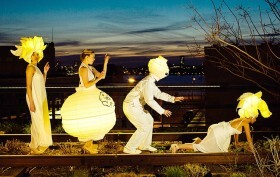 The High Line finally lets visitors stay late to experience a night of illuminated art works, and do-gooders Beauty For Freedom are hosting an art party to benefit young women in India. Be sure to catch a pop up exhibition and book release by Iranian brothers and stencil artists Icy & Sot, and take in a powerful show by female artists at the Untitled Space.